Minnesota Vikings running back Adrian Peterson first made a lot of news this season when he came back from knee surgery and performed much better than anyone (except for maybe Peterson himself) had expected. Peterson last season became the seventh runner in NFL history to gain 2,000-plus yards (he gained 2,097) and fell nine yards short of breaking Eric Dickerson’s all-time record for most rushing yards in a season. “AP” did win his second rushing title in 2012; his first was in 2008 when he outdistanced Atlanta’s Michael Turner by a mere 61 yards for that year’s rushing crown. What makes Peterson’s rushing title last season interesting is that unlike his narrow win in 2008, this 2012 rushing title was no contest. Peterson’s 2,097 yards was 484 yards more than runner-up, Washington Redskins’ rookie Alfred Morris. It was the fifth largest margin for a rushing title since 1970 (the NFL-AFL merger). Here’s a look at the 10 rushing titles that were won by 300 or more yards since 1970. Topping the list is O.J. Simpson, who in 1973 gained 2,003 yards, 859 more than his closest competitor, Green Bay’s John Brockington. Peterson became the first of the seven men who reached the 2,000 yards rushing mark to do so after having less than 1,000 yards gained the previous season. 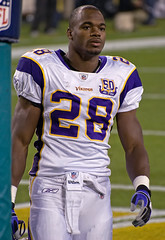 In 2011, Peterson had 970 yards rushing, but he did miss the final four games of the season because of his knee injury. It will be interesting to see how well Peterson performs after his 2,000-yard season this past year. Of the previous six men who had a 2,000-yard season, all of them had fewer yards the following season. In fact, all six of them had at least a decline of 562 yards or more the next season. Terrell Davis had the biggest decline, going from 2,008 in 1998 to only 211 yards the following season (he was sidelined by a right knee injury). Jamal Lewis went from 2,066 yards in 2003 to 1,006 the next year, a decline of 1,060 yards. Barry Sanders had the “best next year” of the 2,000-yard rushers; he went from 2,053 in 1997 to 1,491 the following season (a decline of “only” 562 yards).